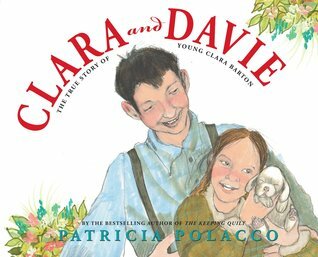 Clara and Davie by Patricia Polacco is a nominee for the 2015-16 South Carolina Picture Book Award. This moving book tells readers of the early life of Clara Barton, the founder of the American Red Cross. Clara, the youngest of five children, had a very special bond with her brother, Davie. Davie encouraged Clara to be herself, he listened to her troubles, and he was always there for her. Even when others called Clara lazy or stupid because of her lisp, Davie looked for ways to make his little sister happy. As Clara grew into a young woman, it became clear to all that she had a way with nature and healing. She loved working with flowers and spending time with animals, but her true gift was healing. She tended to animals and humans alike…and she was soon tasked with caring for her beloved brother, Davie. Just as Davie supported her through difficult times, Clara was determined to help him during his troubles. She did everything she could to nurse him back to health, and her care worked wonders. Clara Barton not only helped her brother to walk again, but, with his support and her own desire to help others, she also went on to become one of the greatest and most beloved medical practitioners in history. 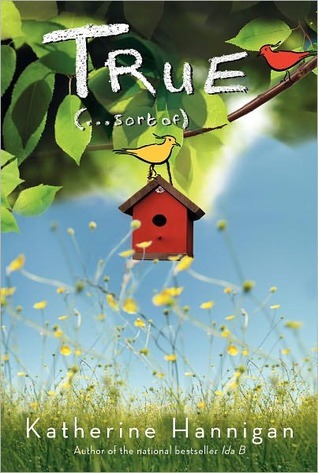 Clara and Davie is a great addition to elementary library and classroom collections. This book would be a wonderful selection for women’s history studies, and it may even be an excellent gift for school nurses. I also think Clara and Davie is a must-read for students who may struggle with speech (or any other) issues. This book demonstrates that those obstacles (for lack of a better word) don’t have to get in the way of doing something that truly makes a difference. Something is very wrong with Liza’s little brother, Patrick. Last night, he was his usual happy-go-lucky self. This morning, though, Patrick is different and wrong, and Liza is certain of what happened. The evil spindlers, spider-like creatures from Below, have stolen Patrick’s soul. It’s the only explanation. So what is Liza to do? Well, she’s going to rescue her brother’s soul, of course! Liza braves the dark and finds an entrance to Below in her basement. Armed only with a broom, Liza enters this strange world in search of Patrick’s soul, but nothing could have prepared her for what she would face. Almost immediately, Liza encounters Mirabella, a talking rat who wears a wig, makeup, and a skirt made out of newspaper. Mirabella helps Liza navigate this strange new world, with all of its dangers and mysteries. Mirabella introduces Liza to troglods, nids, lumer-lumpen, nocturni, and several other creatures that inhabit Below. Some of those creatures are helpful. Others…not so much. The trick is knowing which is which. As Liza and Mirabella travel through Below, they are getting closer and closer to the spindlers’ nest…and to the captive souls within. The journey is becoming more perilous, but Liza is determined to rescue her brother before it’s too late. Will Liza be able to get past her own fear of the the spindlers to do what she must? Who can she rely on when help is needed? Can Liza rescue her brother’s soul–and her own–before the spindlers get the best of her? 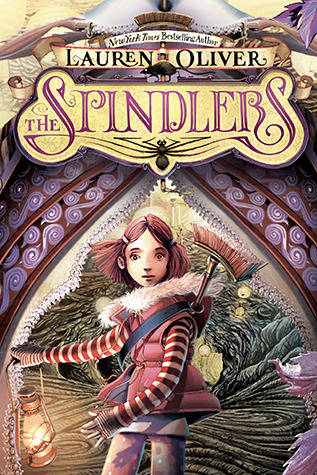 Journey Below for these answers and more when you read The Spindlers by Lauren Oliver. Warning! 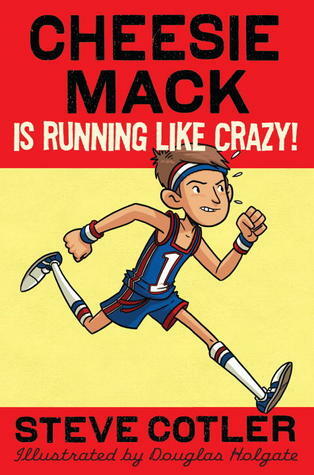 Read Cheesie Mack Is Not a Genius or Anything and Cheesie Mack Is Cool in a Duel before proceeding! Without realizing what’s happened, Travis and Corey have apparently awakened the real ghosts of Fox Hill. Some of the ghosts seem to be rather harmless–moving things around, pinching, pulling hair, setting mice loose in the kitchen, etc.–but there’s one ghost who terrifies all who encounter her (even other ghosts). This ghost seems to be malicious, and Travis and Corey soon realize that it’s up to them to find out who this ghost is and how to finally put her–and the other ghosts–to rest. As Travis and Corey search for what really happened at Fox Hill in the past, they will encounter some disturbing truths. Fox Hill has a dark history, and they will have to make things right before the ghostly residents can have the peace they’ve long been denied. Will these two kids be able to give the ghosts of Fox Hill the rest they crave? Are all of the ghosts even willing to move on? 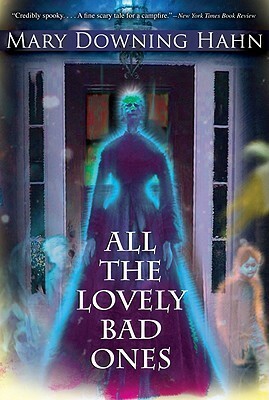 Find out how the dead are finally put to rest–and how the living cope with the truth–when you read All the Lovely Bad Ones by Mary Downing Hahn. 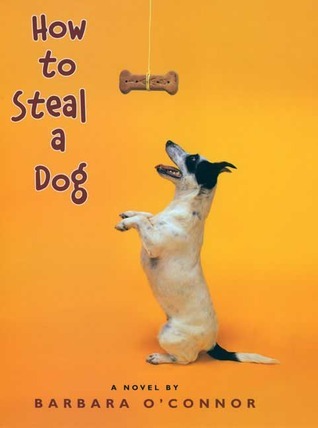 After reading this book, it’s easy to see why so many of my students love it. It’s scary without being too terribly threatening, and good wins out in the end. 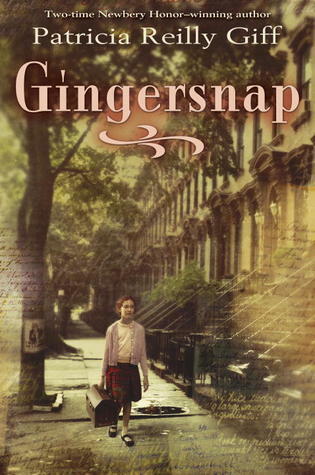 (I’ve only read two of Mary Downing Hahn’s books at this point, but I assume that most, if not all, of her ghost stories are like this. It works.) This book may also convince young readers to research the concept poor farms or poorhouses and how the poor were–and still are–treated in society. I also think young readers will be inspired by Delly’s vocabulary. Her made up words tell so much about her personality, and I hope that my students will create their own vocabulary to explain the truly unique things about their own lives. (There is a “Dellyictionary” at the back of this book with a list of words and definitions for all of the words Delly uses throughout the book.) Even the non-cuss words Delly makes up tell readers how unique–and creative–this character is.